OXFORD, Miss. 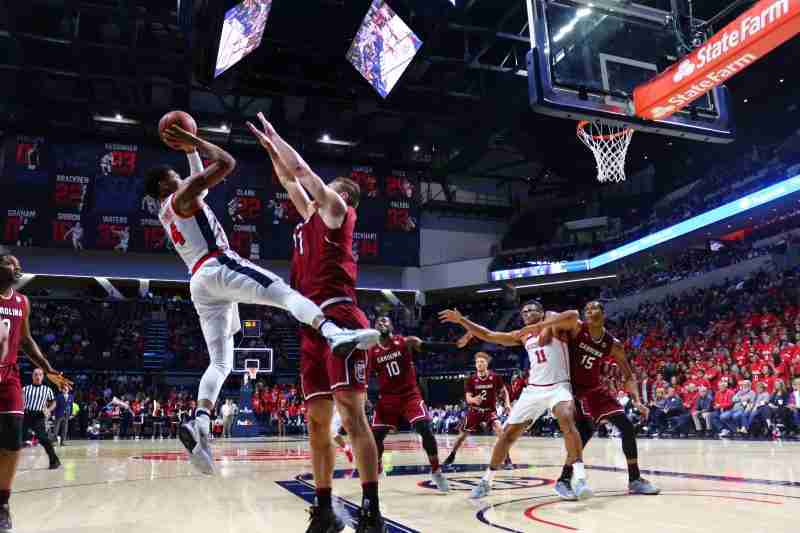 – It’s been a frustrating season for Ole Miss men’s basketball, one that has taken a toll on coaches as well as players. Before this season, sophomore guard Breein Tyree had never lost seven games in a row on any roster of which he was a member. At Monday’s press conference, Tyree described what this season has been like. “The more and more you lose, it becomes not a culture, but it almost became a losing environment,” Tyree said. “It’s hard to get out of a slump, especially as talented as the SEC is this year,” he added. Tyree is correct about the Southeastern Conference being talented this season. In Joe Lunardi’s latest Bracketology, he has eight teams (Texas A&M, Auburn, Kentucky, Alabama, Missouri, Tennessee, Florida, and Arkansas) from the conference currently in his field of 68. Out of the eight teams mentioned, Ole Miss (11-16, 4-10) has beaten the Crimson Tide. The Rebels still the Wildcats, Vols, and the Tigers, left to play. The team’s most recent defeat came last Saturday at the hands of Mississippi State. In the loss, the Rebels’ defense allowed the Bulldogs to shoot 56.4 percent from the field, including making 12 of 23 shots from 3. Nick and Quinndary Weatherspoon combined to score 31 of MSU’s 79 points on 13 of 20 shooting. The day after the game, head coach Andy Kennedy resigned effective immediately. Assistant coach Tony Matlock will serve as the Rebels’ interim head coach until a permanent hire is made. Following the loss to State, Tyree said he talked to his former coach and offered an apology for how the season has spiraled out of control. “We texted a few times after the game, and I apologized to him for falling short and letting him down to a certain extent,” Tyree said. With the uncertainty surrounding the program, Tyree explained he is thinking about his next move, whether that’s staying at Ole Miss or transferring to another institution. “Obviously, I’m keeping my options 100 percent open, because at the end of the day, I’ve got to do what’s best for me,” Tyree said. For the season, Tyree is averaging 9.7 points, 2.2 rebounds, and 2.6 assists per game. Tyree is one of four Ole Miss players averaging double figures in conference play (11.1).